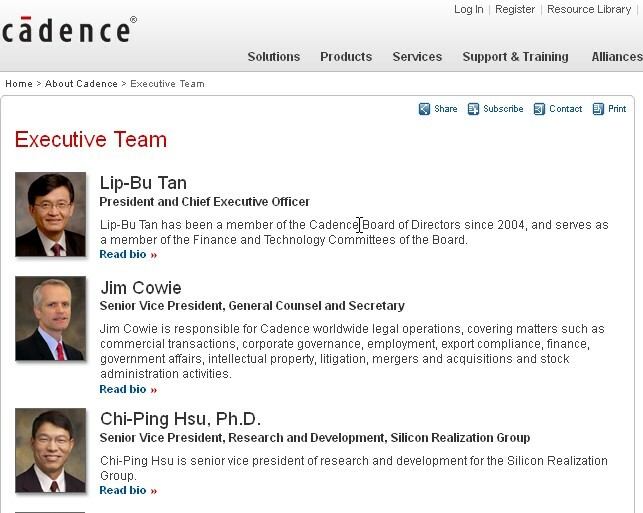 whose picture has been promptly removed from the company's Executive Team profile page. 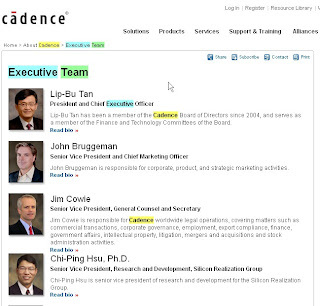 Reports have now been confirmed that John Bruggeman, Cadence's CMO (Chief Marketing Officer), will be leaving the company on August 14th. Item 5.02. Departure of Directors or Certain Officers; Election of Directors; Appointment of Certain Officers; Compensatory Arrangements of Certain Officers. John J. Bruggeman II, Senior Vice President and Chief Marketing Officer of Cadence Design Systems, Inc. ("Cadence") will be leaving the company to pursue other opportunities. 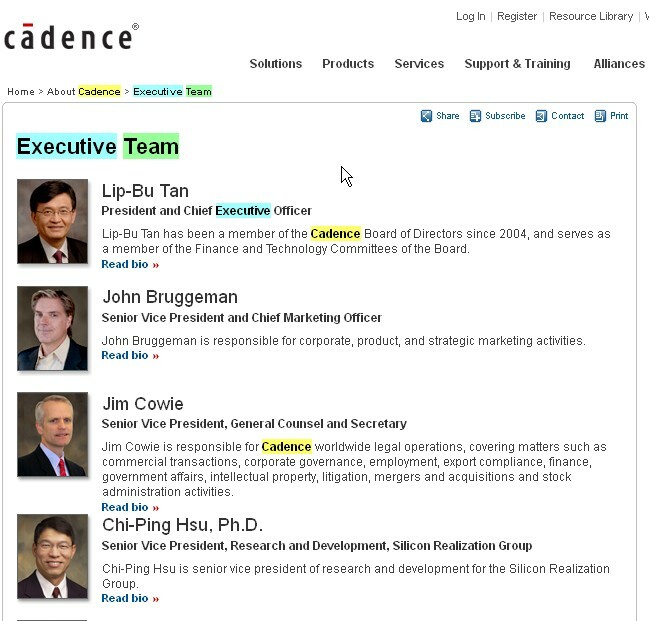 On July 28, 2011, Cadence entered into an agreement with Mr. Bruggeman (the "Transition Agreement") providing for his resignation as Senior Vice President and Chief Marketing Officer. Under the Transition Agreement and subject to certain terms and conditions set forth therein, Cadence and Mr. Bruggeman have agreed, among other items, that Mr. Bruggeman will remain with Cadence as a non-executive employee through August 14, 2011 to assist with transitional matters relating to his function. During this period, Mr. Bruggeman will continue to be eligible to receive his base salary and participate in Cadence's compensation and benefit programs. Under the Transition Agreement, effective August 14, 2011, Mr. Bruggeman's full-time employment will terminate and Mr. Bruggeman will become a part-time employee, at which time Mr. Bruggeman will also become entitled to receive the same benefits as he is entitled to as a result of termination of his employment without cause as set forth in the Executive Transition and Release Agreement included as an exhibit to his Employment Agreement with Cadence, effective August 3, 2010. Bruggeman became well-known as the architect of Cadence's "EDA360 Vision", which has been a very controversial topic since it was published in 2010. While some bloggers see this as the end of EDA360 (see Daniel Neni's post CDNS EDA360 is DEAD! ), the company has invested greatly in positioning their entire product portfolio and branding for alignment with the "manifesto". Cadence has called EDA360 a "Blueprint to Battle ‘Profitability Gap’; Counters Semiconductor Industry’s Greatest Threat". The company has also heavily promoted EDA360 through social media, with a microsite dedicated to evangelizing EDA360 as "The Way Forward for Electronic Design". 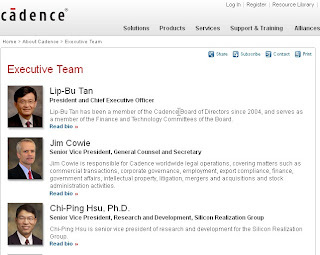 Bruggeman's short tenure at Cadence, after being hired less than two years ago, continues the instability in the company's executive offices that began with the tumultuous Mike Fister era.In the past year, the company hired a PR firm to survey outsiders regarding opinions on the entire executive team. Further changes may be imminent.